Julia Fish, Study for East Stairway with West Stairway, 2006. 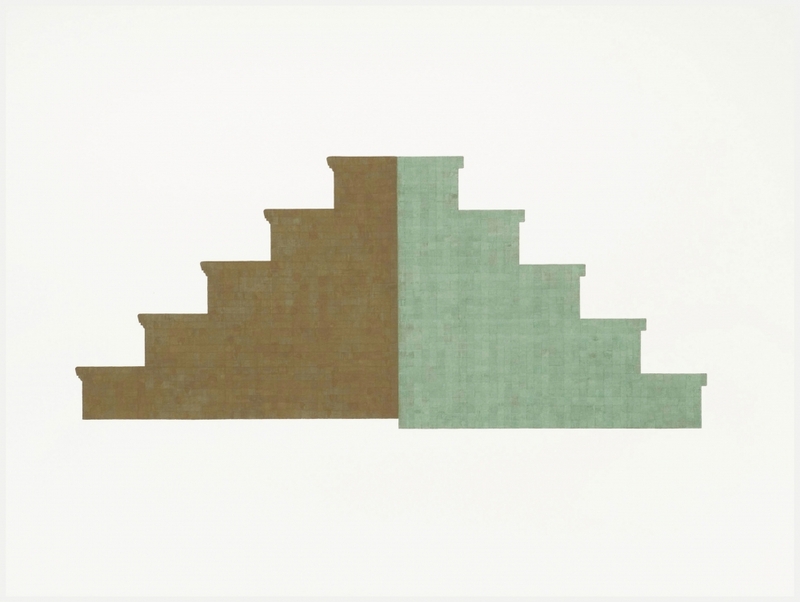 Rhona Hoffman Gallery is pleased to present Julia Fish, Between: Stairs and Landings, works on paper, 2006 – 2007. This is the artist’s second solo exhibition at the gallery and will include recent gouache on paper studies, developed in reference to the east and west staircases of the artist’s residence in Chicago, Illinois. Fish states that “the two stairway spaces are eccentric; each flight requires a specific physical negotiation of stairs and landings that have become integral to every-day lived experience.” This new work translates transitional architectural space in visual and conceptual terms that extend – yet are distinct from – the previous Living Rooms, drawings and paintings completed 2001- 2005. In an ongoing sequence of paintings and works on paper begun by Fish in 1992, the artist has recorded the experience of looking and living within the space of her home and studio residence in Chicago. This study has unfolded as a progression of images generated by close examination and re-presentation of the surfaces and structural configurations of walls, floors and windows characteristic of this typical 1922 two-storey brick storefront. Collectively, these works function as an extended archive of place, revealing the tangible idiosyncrasies of material fact, touch, and scale. Thus, a form is created for the intangible spatial and temporal experiences that reside within the physical site and its urban context. The private site of home has generated a set of connections to more public sites and to an expansive visual and architectural history. Fish’s paintings and drawings have been included in curated exhibitions at the Museum of Contemporary Art, Chicago; the San Francisco Museum of Modern Art; the National Academy of Design, New York, NY, the Chicago Cultural Center; the David and Alfred Smart Museum, University of Chicago; the MAK Center for Art and Architecture / Schindler House, Los Angeles; and the Martin-Gropius Bau, Berlinische Galerie, Berlin, among many others. Her work has been presented in twenty solo exhibitions since 1980, and was the subject of a ten-year survey exhibition at The Renaissance Society at the University of Chicago in 1996. Julia Fish dedicates this exhibition, with deep gratitude, to the memory of Professor Marco Pozzetto (1925-2006) architect and architectural historian, University of Trieste, Italy. Dr. Pozzetto provided generous insight, access and guidance to the work of Max Fabiani, architect (1865-1962), whose graceful, light-filled interior stairways offer extraordinary articulation to his buildings in Vienna, Ljubljana, Trieste and Gorizia, and inspired Fish in developing this recent work.